Glen Johnson is sold to Chelsea. Trevor Sinclair is sold to Manchester City. Irish international David Connolly joins WHU from Wimbledon. Robert Lee joins WHU from Derby. Freddie Kanoute is sold to Tottenham. Matthew Etherington joins WHU in part-exchange. Joe Cole is sold to Chelsea. ★ 09th Preston North End (a). 2-1. (Defoe, Connolly). "And so it begins for a denuded West Ham, with a victory in which fortune played a healthy part. But at the same time they hinted they still have enough quality to see them straight back up", "James' first touch in the Nationwide League was to pick the ball out of his own net", "Half a yard of space was all Defoe needed to stroke an instant shot beyond Preston keeper Jonathan Gould", "Ricardo Fuller was far to skillful and quick for Repka, who was twice fortunate not to concede a penalty", "Etherington set Connolly into space, and the Irish International sped into the area as the defence struggled to get back, beating Gould with ease". The Sunday Times. 13th Rusden and Diamonds (h). 1st Rd.Carling Cup. 3-1. (Defoe, Connolly 2). For the first 15 minutes we looked like world-beaters. Good running and sharp, incisive passing made it look like we were likely to score every time we pushed forward. We took the lead on 10 minutes. Sofiane's ball into the box was partially cleared by a defender to Connolly who had time to steady himself and put in an exquisite chip. The Diamonds' keeper may have just got a finger to the shot which came off the bar to Defoe who made no mistake from six yards", "Four minutes later we were two up. Connolly's attempt to feed Defoe came back to him and the Ant gathered the loose ball, ran at a defender before delivering a superb angled finish inside the far post", "We sat back and conceded territory for much of the match although we rarely looked much like conceding a goal", "Defoe did marvellously well to twist to get a shot in which the Rushden 'keeper could only parry out to Connolly who couldn't miss from a matter of feet". from KUMB Website. News: Sebastien Schemmel is sold to Portsmouth. News: Kevin Horlock joins WHU from Manchester City. 16th Sheffield United (h). 0-0. "Excitement, goal mouth action, thirlls and spills, all the things football fans want to see, and none of them were on show at Upton Park as the Hammers opened their Nationwide home campaign", "Of the players left at the club now, few have ever experienced the bludgeoning, guile less style of play that the visitors exemplifed", "Jermain Defoe came closest to breaking the dead lock, picking up a great ball from Don Hutchison and cutting past three defenders to hammer a shot across the face of goal, it eluded everyone and rebounded back off the far post too quickly for Connolly to control the ball and direct it goalwards. It was not until the final five minutes, with three strikers on the pitch, that the visitors' goal came under any sustained pressure, but they somehow kept out a succession of corners to hold out for the draw that they came for". from OTT Website. News: Glenn Roeder is sacked as West Ham manager. Trevor Brooking takes over on a temporary basis. 25th Bradford City (h). 1-0. (Defoe). "Caretaker Hammers boss Trevor Brooking weaved his magic again as a stunning Jermain Defoe strike got West Ham back to winning ways at Upton Park", "Defoe received the ball from Kevin Horlock and raced past three Bradford defenders before firing the ball into the bottom right-hand corner", "Hammers fans turned out in their thousands to support folkhero Brooking". The Star. News: Trevor Brooking says "If Jermain Defoe goes, I go!". "West Hams brave use of an attacking formation gave them victory and rewarded caretaker manager Trevor Brooking's courage", "Defoe danced around Chris Makin on the right wing and then cut inside and hit an unreachable left-foot shot from the edge of the area. Brooking, normally so reserved allowed himself such an unrestrained touch-line celebration that he had to be ushered back to his technical area by the 4th official", "Connolly's pass sent Neil Mellor bearing down on goal for a shot that Kevin Davis blocked and Connolly, following up, volleyed in the rebound", "At the finish Brooking waved to the West Ham fans who were chanting his name". The Sunday Times. 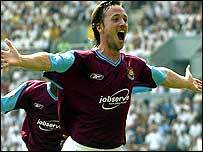 WEST HAM UNITED: James, Repka, Pearce, Dailly, Kilgallon, Carrick, Horlock, Etherington, Connolly, Mellor, Defoe. (4-3-3). News: WHU make official approach for Reading Manager Alan Pardew. News: Reading deny Pardew the chance to talk to WHU. News: Alan Pardew resigns as manager of Reading. "Christian Dailly's first goal for West Ham ensured the Hammers of a third consecutive win", "Trevor Brooking continued with the attack minded formation with three players up front, and the Hammers were rewarded when Wayne Quinn's overlapping run won them a corner. Defoe floated the ball into the area and Dailly met it with a firm header that a covering defender could not prevent hitting the back of the net", "Had Neil Mellor been a bit sharper in front of goal, the home side would already have been two goals to the good by then", "Defoe and Connolly both forced very good saves from the keeper with time running out, only for James to be in the right position to make an easy save of his own from a header that, had the Hammers' keeper not been where he was, would have seen the visitors equalise with the last touch of the game". from OTT Website. "After the Hammers had weathered the early Crewe storm David Connolly struck to settle the visitors nerves", "Connolly's first came from nothing; a poor back pass let the Irish international in; he coolly rounded the keeper and a couple of defenders before slotting home to give the Hammers the lead", "His second was a typical poachers special; Horlock's ferocious free-kick was spilled by goalkeeper Ince and Connolly was on hand to pounce on the loose ball", "Etherington wrapped up the scoring when a fiercely struck shot from 25 yards flew into the top left hand corner of the net. It was a special way to get off the mark", "From then on it was plain sailing for the Hammers who were rarely stretched". from KUMB Website. News:Reading commence legal action in order to prevent Alan Pardew joining WHU. News:The Board announce that from 10th October, Alan Pardew will be the new manager of WHU. Reading drop legal action. "Brooking's men showed none of the swagger and confidence evident in recent games", "The Hammers went into today's game on the back of four straight wins - were never at the races today, having been outmuscled - and, quite frankly, outclassed - by a determined Gills side bent on recording their first competitive league win against West Ham", "To add insult to injury Jermain Defoe was sent off late on for a petulant outburst that will win him few friends amongst Hammers fans. Defoe saw red after verbally abusing the linesman for giving an offside decision against him. That earned him a straight red (despite him having already been booked for unsporting behaviour in the first half)", Brooking said "We take a lot of fans ourselves and it was a cup-tie atmosphere. But they had a greater desire than us and in the end we wilted". from KUMB Website. ★ 23rd Cardiff City (a). 2nd Rd.Carling Cup. 3-2. (defoe 3). "Jermain Defoe struck a stunning hat-trick to turn a lost cause into a sensational victory for West Ham", "His worth to the london club was clear in this blood and guts thriller as they overcame a 2-0 deficit to stun the welsh club", "The hard working Connolly got them back into contention a minute before half-time when he won a penalty which Defoe calmly slotted home", "Defoe's fierce shot was deflected home via defender Danny Gabbidon", "Defoe took a pass from Connolly and cleverly skipped past one defender before sealing that famous fight-back with a sharp drive". The Daily Star. "The first West Ham/Millwall derby for ten years ended in a stalemate thanks to Tim Cahill's late equaliser for the visitors - although in the end it was the Hammers counting themselves lucky to have taken a point from the game", "What will disappoint most is that the Hammers started so strongly, and could have been two or three up by half-time but for some profligacy in front of goal", "Rob Lee's superb through ball left Connolly through on goal; the Irishman twisted and turned past two defenders before coolly slotting home to the keeper's left", "Jermain Defoe was put through with just two minutes to go but instead of laying the ball back to a far better placed David Connolly opted to shoot from a near impossible angle wide to the left of Millwall's goal. The groans inside the ground from the home fans left Defoe in no doubt as to their feelings at his selfish choice". from KUMB Website. 01st Crystal Palace (h). 3-0. (defoe, mellor 2). LP:4th. "Defoe - who was back on form after a disappointing display against Millwall - scored another brilliant individual goal to give the Hammers an early lead. Picking up on a poor back pass he dummied the keeper before scoring from a tight angle despite the close attention of two Palace defenders", "Neil Mellor doubled the Hammers lead with his first goal for the club. Etherington's deep cross was met at the far post by a fierce downward header from Mellor - whose enthusiastic celebrations confirmed how delighted he was to break his West Ham duck", "The on loan striker doubled his tally for the night - and the season - when, he latched on to a pinpoint pass across the 6-yard-box from Wayne Quinn. Despite claims of offside from Palace defenders the unmarked Mellor was allowed to slot the ball home at the far post. ", "Jermain Defoe almost added a fourth for the Hammers on 78 minutes when a superb run culminated in a fierce shot which hit the wrong side of the post and bounced clear". from KUMB Website. Injuries and suspensions hit both sides, and neither really hit their stride to dominate the game, though the keepers each had to make crucial saves, with Oakes the busier of the two, particularly in denying David Connolly. However, with less than a minute of the ninety left, he could nothing about the well struck shot hit by substitute Don Hutchison from Wayne Quinn's corner. Whilst he might have had a few grumbles about the performance, there was no disguising the delight that Brooking felt about leaving Pride Park with the points which lift the Hammers into third place. "Overall we had some good chances and David Connolly could have had a hat-trick." he said, "Derby had a lot of confidence and for spells we were on the rack a bit and I think Derby can count themselves unlucky not to get something out of it. We didn't pass the ball well enough and we are very grateful to get the three points because we were stretched at times in the second half. The ball kept coming back at us and I put Hutch on because he holds the ball up well and then he came up with a great finish." from OTT Website. News: Alan Pardew will officially take up his position as Manager from 22nd October. "West Ham supporters were treated to a glimpse of the future last night, as a fit, well organised team lead by a bright manager outplayed a superior side on their own ground, and were unlucky not to secure a deserved win", "Disappointment over the result shouldn't overshadow the lesson learned last night. It'll be the well-organised teams that'll be in the promotion shake up in May, and that's why the services of Alan Pardew have been acquired". However it wasn't all bad... "The quality of the football produced during the first 30 minutes was certainly the best seen at Upton Park this season, and many in the crowd expressed a preference for this more expansive game in favour of the quick ball over the top that's been used to exploit the speed of the absent Defoe and Connelly". from KUMB Website. "Jermaine Defoe missed at least six clear-cut chances throughout the match", "It was Defoe however that forced Burnley keeper, Jensen to beat out a a shot which led to Connolly putting the Hammers ahead in the 21st minute", "Burnley seemed set for victory until substitute Don Hutchinson's volley four minutes from time"' "Alan Pardew wasted no time in checking whether his new charges have the heart for a quick return to the premiership". "We usually report in on sundays for a light session but the new boss is into modern techniques and has told us to stay at home and do a series of exercises with the heart monitors on" said David James, "We have to bring them back on monday so he can study the results and see what can be done to improve our performances". The Daily Star. "Irishman Andy Reid had put the Hammers in trouble by giving Forest the lead with a wonder strike after only 4 minutes. Then he made a nonsense of that when he gifted West Ham their equaliser by giving the ball away when under no pressure", "Defoe got the goal on 51 minutes", "West Ham had most of the play but Forest impressed by the way thet kept their shape and discipline". The Daily Star. "Alan Pardew had the stark realities of West Ham's stuttering home form laid out before him in all it's glorious shades of light and dark", "The near frantic pace which Pardew attempted to impose from the kick-off worked more in the visitors' favour, and they got off to a flier, when a brilliant run by Reid was rounded off with a goal that even had many of the home fans clapping in appreciation", "However, even after getting back level courtesy of a Jermain Defoe header, West Ham - although by then on the front foot - did not go on to dominate". from OTT Website. News: West Ham have confirmed that they have completed the signing of Crystal Palace star Hayden Mullins. News: Alan Pardew has made his second move in the transfer market inside 48 hours, signing Middlesbrough's Robbie Stockdale on loan, for a month. 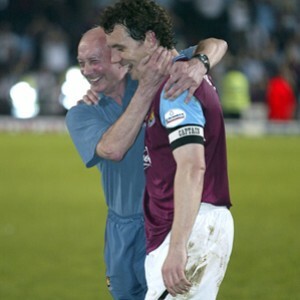 "Despite the two sides conjuring 30 attempts on goal between them (13 to the home side and 17 to the Hammers) only 6 of those managed to hit the target, which meant a quiet afternoon for both goalkeepers - and plenty of frustration for both sets of fans", "It was Cardiff who came nearest to breaking the deadlock, when John Robinson's 65th minute strike beat David James - but not his far post. For the Hammers, Jermain Defoe went closest when he found the net with just 6 minutes left on the clock, but he was adjudged to have been narrowly offside". Pardew, speaking to reporters after the game said: "Cardiff also have good players and they could even be play-off contenders. The relegation (from the Premiership) has taken its toll on us and we really need two or three more players. I'm unbeaten after two games although I would dearly love to get my first victory". from KUMB website. 29th Tottenham (a). 3rd Rd.Carling Cup. 0-1 (AET). 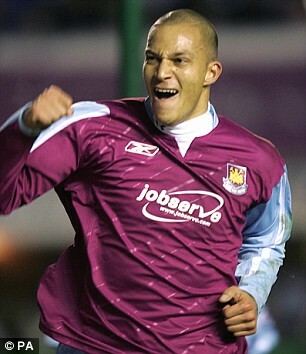 "The interminable law of the ex haunted West Ham, as Hammer's fan and former youth teamer Bobby Zamora decided a closely fought derby in favour of Tottenham", "West Ham fans can hold their head up high as a greatly weakened team more than matched their supposedly superior neighbours only to be let down, not for the first time this season, by poor finishing and a lack of forward options", "West Ham should have opened the scoring, when Defoe followed up some excellent close control to release the onrushing Lee with a chip into the Spurs box. The veteran took one touch before guiding a left footed strike past Keller, only to see it rebound back to the keeper off the inside of the far post". from KUMB website. News: Alan Pardew signs striker Brian Deane from Leicester City on a free transfer. 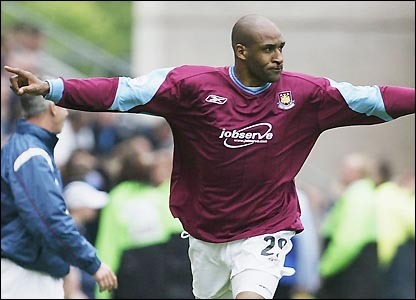 "It was probably the right result, coming from two sides who lacked the necessary fire power to take all three points", "On his Hammers' debut, Brian Deane did nothing of note, and in spite of numerous corners, not once was one put in which gave him the chance to do what he does best, smash defenders out of the way as he bullets the ball into the net with his head", "Defoe's goal came at the end of the one concerted spell of pressure that Coventry were put under, they failed to get the ball out of their half for several minutes, and eventually, it fell to him and he slipped past the last line of defence to beat the keeper", "Repka - not for the first time - was caught out of position, allowing his man to get past him and cut the back across the face of goal, giving the scorer an easy tap-in from all of a yard out", "The second half was a litany of failure on both sides, and a more shambolic, haphazard, error strewn forty-five minutes of football is hard to recall". from OTT website. 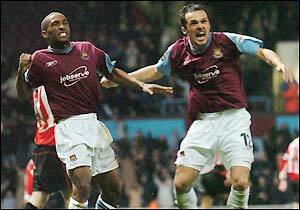 "A seven goal match at Upton Park saw a remarkable turnaround, as West Ham went three-nil up inside fifteen minutes, but ended up losing four-three", "Etherington robbed a defender to set Defoe away to score from a tight angle with only twenty seconds on the clock, Hutchison doing likewise minutes later to set up Brian Deane for a second. Comical defending at a free-kick gifted Deane a free header inside the six yard box for the Hammers' third. ", "But, as if trying to show that no matter how bad their defending was, they could see worse, Dailly dallied, and in nipped Hulse to poke it past the too late on the scene James", "The panic which suddenly spread throughout the Hammers' side was as palpable as the sensing of blood that just as suddenly spread throughout the Baggies". from OTT Website. "Angry Alan Pardew threatened to dump the West Ham super-flops", "I intend to go places with this club and if the players don't want to come with me I'll bring in some who do". The Daily Star. "David James pulled off a superb save in the first half to keep a volley from Devlin out, but West Ham dominated the first 45 minutes", "Watford had the better of the second half", "We are not a million miles away and I do believe we can get in the play-offs with this team, but to win automatic promotion we need more bodies" - Alan Pardew The Star. 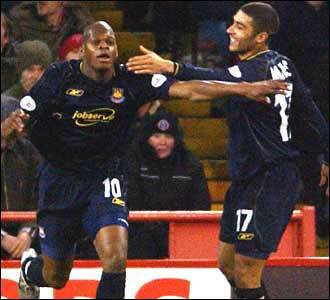 News: Striker Marlon Harewood joins West Ham from Nottingham Forest for £500,000. "West Ham's run without a win stretched to 9 games as Alan Pardew's men produced yet another abject display against bottom club Wimbledon. And but for some sterling work by keeper David James it could have been even worse", "Brian Deane put the Hammers ahead just six minutes after the break when he neatly converted a low cross from Kevin Horlock", "That goal received strangely muted recognition from the 2,000+ travelling Hammers faithful; perhaps they knew what lay ahead. As for the umpteenth time this season the Hammers threw away a lead when they allowed McAnuff to equalise from close range 12 minutes later. The Hammers rearguard failing to deal with a Patrick Agyemang cross". from OTT Website. "Two up after twenty minutes, thanks to an early goal by Kevin Horlock and an own goal, the Hammers could not rest easy, and it was not until the third goal had gone in after the visitors were reduced to nine men that the victory looked in any way secure", "If there were sighs of relief from and for Alan Pardew, there were whoops of delight at the performance of new signing Marlon Harewood. Making his home debut, he had a big part in both opening goals, and went on to score the two in the second half. Lively and strong, as well as fleet of foot, he has all the makings of an Upton Park hero". from KUMB Website. Apologies, but the report text for December 2003 to March 2004 seems to have been lost when this site was updated?? 06th West Brom. Albion (a). 1-1. (deane). 09th Stoke City (h). 0-1. 13th Sunderland (h). 3-2. (defoe x2, pearce). 20th Walsall (a). 1-1. (harewood). 26th Ipswich Town (h). 1-2. (defoe). ★ 28th Nottingham Forest (a). 2-0. (harewood, deane). 04th Wigan Ath. FA Cup 3rd Rd. (a). 2-1. (mullins, connolly). 10th Preston North End (h). 1-2. (connolly). ★ 17th Sheffield Utd (a). 3-3. (connolly, harley, harewood). 25th Wolves. FA Cup 4th Rd. (a). 3-1. (deane, harewood, connolly). 31st Rotherham (h). 2-1. (deane, dailly). 07th Bradford City (a). 2-1. (zamora, harewood). 14th Fulham. FA Cup 5th Rd. (a). 0-0. 21st Norwich City (a). 1-1. (harewood). 24th Fulham. FA Cup 5th Rd. Replay. (h). 0-3. 28th Cardiff City (h). 1-0. (zamora). 09th Wimbledon (h). 5-0. (etherington x3, zamora, reo-coker). 17th Crewe (h). 4-2. (harewood x2, reo-coker, mcanuff). 21st Millwall (a). 1-4. (harewood). 27th Gillingham (h). 2-1. 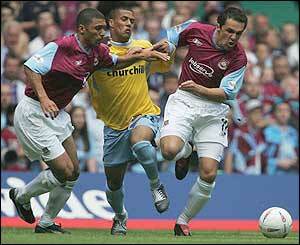 (zamora, etherington). ★ 03rd Reading (a). 0-2. LP:4th. If the anticipated volleys of hate aimed Pardew's way were less than ferocious, they were more than matched by the lack of heart, passion and desire shown by the West Ham team. If he had instilled any of the necessary qualities required for a stiff upper lip and resolve in what, for him, was a match he was desperate his players to ensure they stood up and be counted in, they were - on the evidence they presented on the pitch - soon forgotten. Whilst he stayed firmly on his feet throughout, with his head well above the parapit, his players ducked out of their responsibilities, surrendering meekly to a team who did not exactly have to raise their game to the level either he, the fans, or they had the right to expect. from OTT Website. ★ 10th Derby County (h) 0-0. "West Ham are offering free admission to watch training at Upton Park this week. It will probably be more entertaining than this leaden match under leaden skies that served only to offer Derby a useful point. It would have been three had not a linesman wrongly disallowed them a goal in added time" The Independent. 12th Crystal Palace (a). 0-1. "Given how poor the refereeing was, it was something of a surprise that Connolly was the only player to get the red card, because he could easily have been joined by Repka (persistant fouling), Harewood (rowing as the teams went off at half-time), Srnicek (for tripping Johnson up) and Zamora (for a blatant elbow)", "Neither side was capable of holding on to the ball during a poor first half, the Hammers probably not helped by Pardew's decision to chop and change the team as much as he did, but overall, given how rudderless they looked at Selhurst Park, it is hard to argue that even with what amounts to their strongest team they'd have got anything from the game" from OTT Website. "It was not until late in the match that the points were finally secured for West Ham, they could not build upon Bobby Zamora's first half opener, and it took a penalty - converted by David Connolly - to ease their obvious edginess. With the experienced duo of Steve Lomas and Kevin Horlock in the middle of the park, David Connolly putting every ounce of effrot in, and Hayden Mullins in good form, the Sky Blues just could not get a foot hold in proceedings" to come. 24th Stoke City (a). 2-0. (connolly, harewood). A David Connolly goal put the Hammers in front before half-time at the Britannia Stadium, and Marlon Harewood doubled the lead in the second half", "Harewood scored on the hour mark, rounding off a superb move which began when Zamora played a one-two with Connolly, before setting Etherington off down the wing; his excellent far post cross was nodded in by Harewood". from OTT Website. ✈ 01st Watford (h). 4-0. (hutchinson, dailly, harewood 2). LP:3rd. "Hutchison was nothing if not fired up in the opening 20 minutes - notably when his powerful surge with the ball towards the Watford box led to Gavin Mahon bringing him down and Hutchison scoring from the free-kick. It was his first goal since October and only his third of the season. With the Scotland international continuing to cause Watford problems, a goal from Christian Dailly and two from Marlon Harewood made things even worse for them" from The Observer. 09th Wigan (a). 1-1. (deane). LP:4th. "The Hammers were knocked out of their stride by the sheer energy of Wigan's start, but weathered the storm, and not until Alan Pardew brought on David Connolly for Don Hutchison on fifty five minutes did they begin to show any real threat. Marlon Harewood had a goal bound header cleared off the line, as the home side began to show a few nerves, and perhaps sensing this, Hammers' boss threw on the experienced Brian Deane". "There were less than two minutes of the ninety remaining when Nigel Reo-Coker won what looked a dubious free-kick some twenty-five yards out, and when the ball was swung into the penalty area, up popped Deane to deliver a knockout blow to Wigan's season, and prolong the Hammers" from OTT Website. ★ 15th Ipswich Town (a). PLAY-OFF SEMI 1st LEG. 0-1. "A single goal from Ipswich forward Darren Bent put a dent in promotion hopes as West Ham failed to turn a number of chances into goals at Portman Road this afternoon. An open game that promised goals but produced few thanks to wasteful finishing", "The first half produced much for both sides, Zamora going closest for the Hammers, firing a shot from the 18 yard line just wide of the post, and then dragging a chance wide of the far upright when inside the area. Despite the nervous excitement, ZamoraÕs frustration summed up the performance", "A rifled shot from Naylor rattled the cross bar and boomeranged straight at Repka. Tomas froze, the ball spun in the area, and Bent headed into the empty net. West Ham urged themselves forward, but as frustration took hold first touches became clumsy and final balls ended up at opposition feet". from KUMB Website. ★ 18th Ipswich Town (h). PLAY-OFF SEMI 2nd LEG. 2-0. (etherington, dailly). "We went for it right from the very start", "Repka rescued a loose ball down the right and crossed from the byline, finding Connolly in the box. Connolly turned and clipped a cross into the path of Zamora, whose header brought out one of the saves of the season from Davies in the Ipswich goal. Fabulous football all round Ð and only 11 minutes gone!". "With 20 minutes left a bywater clearance found Connolly whose turn was superb. The resulting shot clipped off a defender for a corner. Etherington's delivery was played by a defender straight into Dailly's wedding tackle. The skipper stayed on his feet long enough to poke the loose ball (no pun intended!) into the bottom right hand corner to cue more wild celebrations", "On 90 minutes it was heart in mouth time. A long throw from the right came out to Westlake whose shot came back off the post. We had to endure three minutes of stoppage time", "Ipswich forced a couple of corners before the ref finally blew the whistle to cue Bubbles, Twist & Shout, Viva Bobby Moore, Knees Up Mother Brown. The sight of everyone doing the Twist & Shout was something to behold". from KUMB Website. ★ 29th Crystal Palace (Cardiff). PLAY-OFF FINAL. 0.1. "Many questions were being asked beforehand about which West Ham would turn up - would it be the side that disappointed so at Portman Road in the first leg - or the side which offered a hugely impressive performance in the return leg, in the game which sent West Ham through to today's final", "Zamora could have converted a one after he was sent clear on goal thanks to a fabulous pass from Michael Carrick, who was surely playing his last game in claret and blue. However Zamora crashed his shot against the keeper", "Not unexpectedly Palace took the lead after Stephen Bywater failed to divert a Johnson shot, and Neil Shipperley ghosted in between three static defenders to clinch the goal", "Almost immediately the Hammers had the ball in the net when David Connolly chipped the advacing keeper, but it was (rightly) ruled offside. Minutes later West Ham thought again that they had produced the equaliser when Zamora stabbed home from close range. However the linesman had decided that the former Brighton man was offside; it looked marginal at the time", "Graham Poll firmly lodged himself alongside the likes of Keith Hackett in the annals of 'Most Hated Referees' by denying a cast iron penalty for a foul on Michael Carrick with just minutes remaining. So blatant was the foul that even the watching Hammers fans were stunned into near silence by Poll's refusal to award a spot kick. To be denied such an obvious penalty with so much at stake was the cruelest blow. Poll's grin afforded to any appealing Hammer particularly rankled. Bearing in mind this referee's previous history with West Ham questions should be asked as to how he was awarded the task of officiating in the club's most important game in a generation". from KUMB Website. 14 x Jermain Defoe. Carling Cup = 4. Sold to Tottenham, 2.2.04. 14 x David Connolly. Carling Cup = 2. FA Cup = 2. 14 x Marlon Harewood. FA Cup = 1. 7 x Brian Deane. FA Cup = 1. 1 x Hayden Mullins. FA Cup = 1. 1 x Ian Pearce. Sold to Fulham, 16.1.04. A transitional season, where the team that got us underway back in august was not the team that played in the play-off final, except of course for that pairing of repka and daily at the back. If you ask me, those two should have have been first out the door! Carrick being the only quality player not to turn rat and jump ship! But you know it's coming. One thing is for sure during the season some damning articles about the clubs chairman, Mr T. Brown have shown him to be devoid of any ambition, sell, sell sell. And if we ever manage to get another crop of talented youngsters, you can be sure he'll off-load them at the earliest opportunity! The jury is out on Pardew at present, when his team get it together, I admit we look good, but for me we always lacked an edge when it came to the crunch games (ipswich at home apart). Moaning over... lets hope we do not have to bother with the nightmare of the play-offs next season... Champions would be nice! Come on you Irons!